Sound Strider has already made a name for himself on the experimental frontiers of psychedelic music with Intrepid Travels and Padovan Sequence. 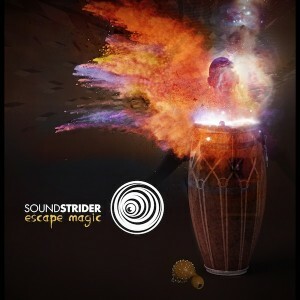 Now he returns with Escape Magic, a release aimed squarely at the dance floor fusing two epiphanic life experiences: hours of ecstatic dancing at eclectic electronic music gatherings across the globe as well as several trips to Cuba and Morocco interacting with the Santeria and Gnawa musico-spiritual cultures. These four tracks blend live recordings from the aforementioned traditions with old school Goa vibes and hypnotic techno rhythms to create a liberating melange of audio tomfoolery divinely designed to help you escape the dreary confines of everyday life and enter into an enlightened frenzy of movement and insight. Mastered by Anti-Logic with artwork by Clint Grierson. MP3 Download | FLAC Download | WAV Download · Download count: 3,196.
me likesed it! well don! The first few times I listened to this I did not like this at all. I am not a musician so I looked up “polyrhythm”, not sure if I truly understand it from the few moments I read it over, but I guess its like when I first started listening to indian classical music or some good jazz; the time signatures make it sound unpalatable if you are always listening to western traditional music. Once you listen to it long enough though, you begin to really enjoy it. I remember when I bought a record from Mahavishnu Orchestra how it sounded very strange at first but then it grew on me. absolutely excellent stuff. very creative and psychedelic. love it! Magical, deep, and inventive! I LOVE this! I did not want it to end! I really look forward to the next Sound Strider release. Top notch stuff, will probably listen to this forever. very bizarre. the production isn’t great, harsh on the ears in many spots. I like the creativity though. jury’s still out.